Obverse: DIVVS AVGVSTVS VESPASIANVS, Laureate head right. Reverse: EX S C, Shield set on a column which is surmounted by an urn; laurel branch on either side. Obverse: IMP CAESAR VESPASIANVS AVG, Laureate head right. Reverse: CAESAR AVG F COS CAESAR AVG F PR, Titus bare head right facing Domitian bare head left. Reverse: COS ITER TR POT, Aequitas standing left, holding scales and scepter. Reverse: COS ITER TR POT, Pax standing left with branch and caduceus. Reverse: COS ITER TR POT, Pax seated left, holding branch and caduceus. Reverse: COS III TR POT, Aequitas standing left, holding scales and rod. Reverse: IVDAEA in exergue, Judaea seated right in attitude of mourning with hands tied behind back; palm tree to left. Reverse: PAX AVGVST, Pax seated left holding branch and sceptre. Obverse: IMP CAES VESP AVG P M, laureate head right. Reverse: TRI POT II COS III P P, Pax seated left, holding branch and caduceus. Reverse: VIC AVG, Victory standing right on globe, holding wreath and palm. Obverse: IMP CAES VESP AVG P M COS IIII, laureate head right. Reverse: NEP RED Neptune standing left, right foot on globe, holding acrostolium and sceptre. Reverse: Vespasian in triumphal quadriga right. 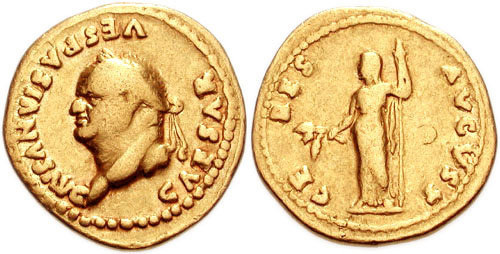 Obverse: IMP CAES VESP AVG CEN, laureate head right. Reverse: PAX AVG, Pax standing left, leaning on column, holding branch, caduceus; before her is a money sack on a tripod. 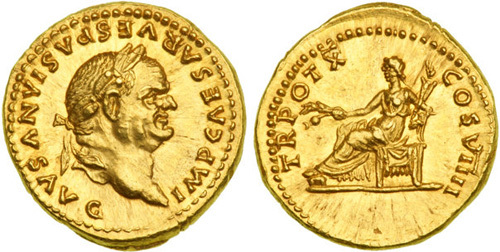 Obverse: IMP CAES VESP AVG CEN, laureate head right (starting low left, inwardly). Reverse: VESTA, tetrastyle Temple of Vesta containing statue of Vesta standing left on low basis, holding patera and long scepter; two statues to either side holding long scepters. Obverse: IMP CAES VESP AVG CENS, laureate head right (starting low right, outwardly). Reverse: VESTA, Round tetrastyle Shrine of Venus with three statues within. Reverse: COS VI, Bull butting right. Reverse: PON MAX TR P COS VI Victory, holding wreath, standing left on cista mistica flanked by snakes. Reverse: COS VII Cow walking right. 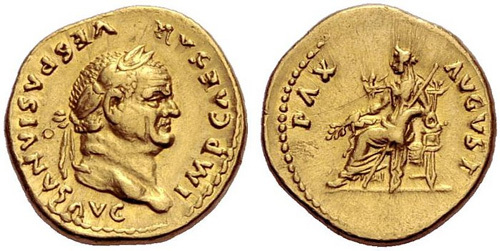 Reverse: COS VIII in exergue, Vespasian standing left, holding spear and parazonium, being crowned by Victory. 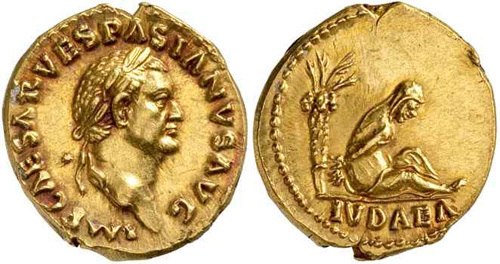 Obverse: IMP CAESAR VESPASIANVS AVG, laureate head left. 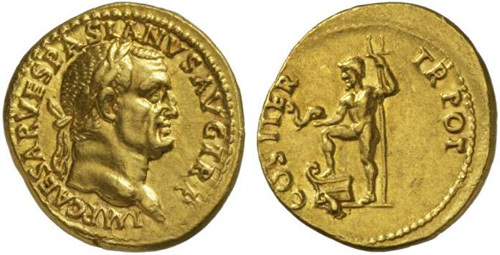 Reverse: COS VIII in exergue, Vespasing standing left, in military attire, holding sceptre and parazonium, crowned with wreath by Victory standing behind him and holding palm branch in left hand. Reverse: TR POT X COS VIIII, Ceres enthroned left, foot on rest, holding poppies and ears of grain. Obverse: IMP CAESAR VESPASIANVS AVG Laureate head right. 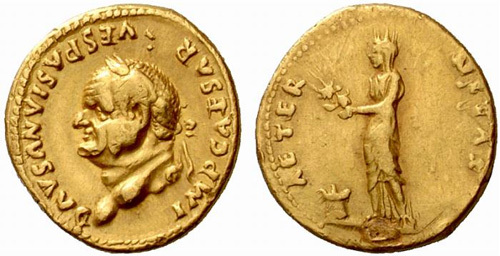 Reverse: AETERNITAS, Aeternitas standing left, holding heads of Sol and Luna; at her feet, lighted altar. Obverse: IMP CAESAR VESPASIANVS AVG Laureate head left. Reverse: AETERNITAS, Aeternitas standing left, holding heads of Sun and Moon; at her feet, lighted altar. Obverse: CAESAR VESPASIANVS AVG, laureate head right. Reverse: ANNONA AVG, Annona enthroned left, holding sack of grain ears in her lap, ties in hand. Obverse: CAESAR VESPASIANVS AVG, laureate head left. Reverse: CERES AVGVST, Ceres standing left, holding two grain ears and poppy in right hand, scepter in left. 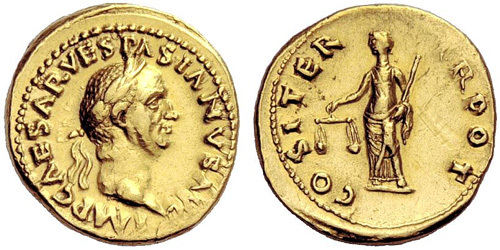 Obverse: IMP CAESAR AVG VESPASIANVS, laureate head right. Reverse: MARS VLTOR, Mars advancing right holding spear and trophy. Obverse: IMP CAESAR VESPASIANVS AVG TR P, Laureate head right. Reverse: COS ITER TR POT, Neptune standing left, right foot on prow, holding dolphin in extended right hand and trident in left. Reverse: COS III FORT RED, Fortuna standing left, holding globe and caduceus. Reverse: COS III TR POT , Aequitas standing facing, head left, holding scales and sceptre. Obverse: IMP CAES VESPAS AVG P M TR P IIII P P COS IIII, Laureate head right. Reverse: PACI AVGVSTI, Nemesis advancing right, holding cadudeus; before her, serpent.